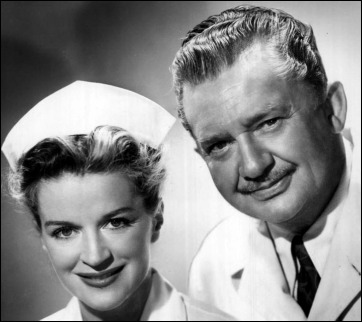 JEAN HERSHOLT AS DR. CHRISTIAN & ROSEMARY DeCAMP AS HIS NURSE, JUDY PRICE. Jean Hersholt was one of Hollywood’s busiest character actors. In 1932 alone, the Danish born Hersholt appeared in eleven MGM films, including the Oscar winning Grand Hotel. Although he never won an Academy Award for his acting, Hersholt was President of the Academy of Motion Picture Arts & Sciences from 1944 to 1948 and was presented with two Honorary Awards for his service. The Academy’s Humanitarian Award is named in his honor. During this period Hersholt began a collaboration with McCann-Erickson radio producer Dorothy Barstow who was looking to develop a new program for the agency’s client, Chesebrough Manufacturing, makers of Vaseline products. (2) Hersholt wanted to extend his Country Doctor screen character, Dr. John Luke, into a radio series but he was unable to clear rights to the name. So, he created his own character. While he continued polishing the show’s details with Barstow, Hersholt appeared in another half-dozen films for Fox. He became a household name in October, 1937, by playing the long lost grandfather of nine year old Shirley Temple in the classic tear jerker, Heidi. The following month, on Sunday afternoon, November 7th, Dr. Christian debuted on CBS, (also posted below). Its first and only sponsor, Vaseline would remain with the show for the next 17 years. The program was popular but allowed to complete its first season on April 24, 1938, because of Hersholt’s heavy movie commitments - four more films for Fox in 1938. Dr. Christian returned to CBS as a prime time program on Tuesday, October 18, 1938, but it was assigned to the suicidal timeslot of 10:00 ET, opposite NBC’s emerging superstar, Bob Hope. (The second show of that season, November 1, 1938, is also posted below.) The comedian buried the kindly doctor in the season’s ratings, 15.4 to 6.7 - 12th place to 79th. It was a situation that would kill most struggling shows, but the crafty Dane was just getting his act together - literally. Hersholt’s final film for Fox, Mr. Moto In Danger Island - in which he’s cast as a multiple-murdering villain (!) - was released on April 7, 1939. Four nights later Dr. Christian left the air for the season and Hersholt went to work on the first of his six Dr. Christian films for RKO. In their two month head-to-head competition Kyser’s musical quiz scored a 16.7 Hooperating to Dr. Christian’s 8.7. But Hersholt and Barstow - now Dorothy McCann - convinced the network and sponsor to move Dr. Christian back 90 minutes to the more family friendly timeslot of 8:30 ET opposite NBC’s Avalon Time hosted by comic Cliff Arquette. The switch was made on January 3, 1940, and ratings reflected the change immediately - Dr. Christian’s Hooperating jumped 60% from December’s 8.4 to a 13.4 in January. More promotional push was provided by RKO with the April release of Courageous Dr. Christian. (5) As a result, in their four months of direct competition, Dr. Christian’s average rating of 13.5 beat Avalon Time’s 10.6 on NBC and the 5.8 registered for Tums’ game show Quicksilver on Blue. The switch to 8:30 also advanced Dr. Christian into Wednesday’s Top Ten - the first of 14 consecutive seasons in which the kindly doctor would achieve that ranking. (6) In July of 1940, it became obvious that Chesebrough was fully committed to the program when it gave Hersholt a guaranteed two year contract worth $80,000 and ordered 52 new shows a year. The radio contract enabled Hersholt to virtually retire from his film career and devote most of his time to developing the Motion Picture Relief Fund and its Country Home retirement facility which he spearheaded. But the year round schedule of programs created a constant demand for new material - well written stories and scripts in keeping with the wholesome Dr. Christian standards. Although no individual is credited for coming up with the idea, producer Dorothy Barstow McCann was responsible for the January 28, 1942, announcement of the Dr. Christian Scriptwriting Competition. Listeners were invited to send for contest rules and requirements for writing radio scripts for the show. Winning entries each week would be awarded a minimum prize of $150, given a recording of their script being performed and a shot at the annual Grand Prize of $2,000. Hershot became known as a workhorse for his weekly appearances without a break for vacations. But in June, 1945, the government called him into duty for a goodwill mission to his native Denmark, still recovering from World War II. Hersholt's friend, character actor Claude Rains, took over Dr. Christian’s practice as Dr. Alexander Webb during his brief absence. The unique program from June 20, 1945, starring Rains, (posted below), features a shortwave commentary by Hersholt from Copenhagen. Two more shows from that period, The Attic Stairway Murder from October 17, 1945, and Old Battle Axe from November 2, 1949, demonstrate the variety of script material submitted to the competition which drew 8,000 entries in 1946 and an eight year total of over 69,000 by 1950. Network acceptance of tape recording made the October 4,1950, broadcast possible in which Hersholt is heard in the play, Love Is A Two Sided Thing, and then appears as himself speaking to the Medical Society of The District of Columbia. In those remarks, (posted below), the humble Danish actor reveals his sincere respect for the medical community and his gratitude for the ability to share that respect with his millions of listeners for over a decade. Among all rated prime time programs, Dr. Christian scored twelve Top 50 seasons which included five in the Annual Top 25. The program built a remarkably loyal audience as seen in the decade from 1939 to 1949 when its season’s average ratings never exceeded 13.9 (twice), nor fell below 11.7 (three times), for a ten year average of 12.7. But no one was more loyal to the program than Jean Hersholt and his sponsor, Vaseline. Both were with the Dr. Christian from its 1937 beginning until it left the air in 1954 - all 789 episodes. Shortly before his dealth in 1956 at age 70, Hersholt appeared in two episodes of Ziv's syndicated Dr. Christian television series starring MacDonald Carey as his nephew who took over his medical practice. That series went out of production after 39 episodes. (1) Jean Hersholt received sixth billing in all three films beneath Annette, Cecile, Emelie, Marie and Yvette Dionne who appeared as The Wyatt Quintuplets. Hersholt’s character based on Dr. Dafoe was called Dr. John Luke. (2) Dorothy Barstow was also known for her work in establishing and producing the long running multi-network anthology Death Valley Days for its creator, Ruth Cornwall Woodman. Barstow married McCann-Erickson’s Harry McCann in 1939 and became head of the agency’s radio department. She and McCann were killed in a December, 1962, car crash. (3) Rosemary DeCamp relinquished the role of Judy Price to versatile radio actress Lurene Tuttle from 1938 to 1943. DeCamp returned from 1943 until the show left the air in 1954. Helen Claire played Judy Price when the show periodically originated from New York. Janet Waldo and Kathleen Fitz also appeared in the role occasionally. (4) RKO couldn’t lose. It released Meet Dr. Christian on November 17, 1939. One week later the same studio released That’s Right, You’re Wrong! starring Kay Kyser and his Kollege of Musical Knowledge cast and orchestra. (5) The Dr. Christian films were low-budget B movies approximately 65 minutes in length. RKO released two more in the series in 1940, Dr. Christian Meets The Women and Remedy For Riches. The final two, Melody For Three and They Meet Again were released in 1941. (6) The only threat to Dr. Christian’s popularity in its 8:30 ET time period was provided by NBC’s Great Gildersleeve from 1946 to 1953. In head to head competition over the seven seasons, Gildersleeve won the time period five times and Christian won it twice. However, both shows remained in Wednesday’s Top Ten over the entire seven years.